Need to get your Borderlands 2 fix, but you can't wait until September 18th? Developer Gearbox Software has got you covered. 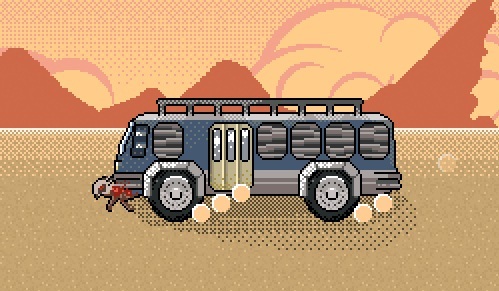 If you're into old school shooters (and I mean really old school), you need to check out "The Border Lands," a free browser demake featuring the four new Vault Hunters from Borderlands 2. 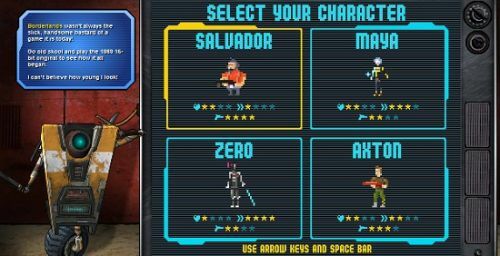 You'll be able to choose either Salvador, Axton, Maya, or Zero and battle waves of enemies. Each character has their own health, speed, and firepower stats. You can level up to regain health and pick up new weapons along the way. It's really quite charming. The only real bummer is that this is a solo affair. The Borderlands 2 wubwub hub page has some other novelties, such as the "Gun-Off" and "Mount Jackmore," listed as coming soon. (If you look at the small print you can see that "Mount Jackmore" is a "3D multiplayer game." Cool.) Feel free to wildly speculate. You can also check out the badass live mural from Gamescom, which has all sorts of fun information. Borderlands 2 supports two player local co-op, four player online co-op, and combo co-op. It will be available on the Xbox 360, PlayStation 3, and PC on September 18th.